Austin Foot and Ankle Specialists utilize the state of the art Extreme 1012. The first fully automatic CR scanner dedicated to digital imaging for extremities. 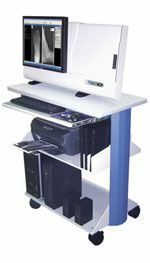 Our solutions for digital diagnostic imaging is specially tailored for the needs of the foot and ankle physician, and offer powerful productivity capabilities to significantly reduce turnaround time of traditional x-ray processing. Our x-ray images utilize familiar cassette-based procedures which efficiently appear on in room monitors in DICOM format, ready for manipulation, annotation, and diagnosis. We can securely forward patient images to distant colleagues, share them with patients in the exam room, review them prior to surgery, or file them in digital archives.